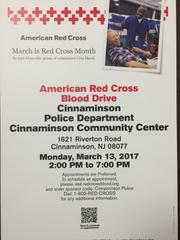 The Cinnaminson Police Department is hosting a Red Cross Blood Drive on Monday March 13, 2017 at the Community Center. Your help is desperately needed. Please see the attached flyer for details. Thank you.